The audio launch of I, which happened yesterday, the 15th of September, with much glare and flair was an incredible success. One of the highlights of the grand function was Arnold’s speech. The 'Terminator' walked on to the stage with the rocking 'Judgment Day' music in the background. Both Arnold and our 'Superstar' Rajinikanth have their own share of followers and own way of doing things. Arnold started his speech with a punch dialogue ‘I do things my way’. Does it not remind us of the famous Rajini dialogue from Padaiyappa ‘En Vazhi thani Vazhi’? Speaking at the function Arnold said that it was wonderful to meet Shankar and also made a request to him to cast him in his next film. He was also pleased for the body-builders who got a chance to showcase their talent on such a big stage, as Arnold himself started his career as a body-builder before going on to become a Hollywood star. 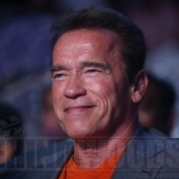 Arnold also thanked Aascar Films for all the arrangements. Jeeva Shankar To Direct Arya After Sathya? People looking for online information on Arnold Schwarzenegger, I audio launch, Rajinikanth, Shankar, Terminator will find this news story useful.